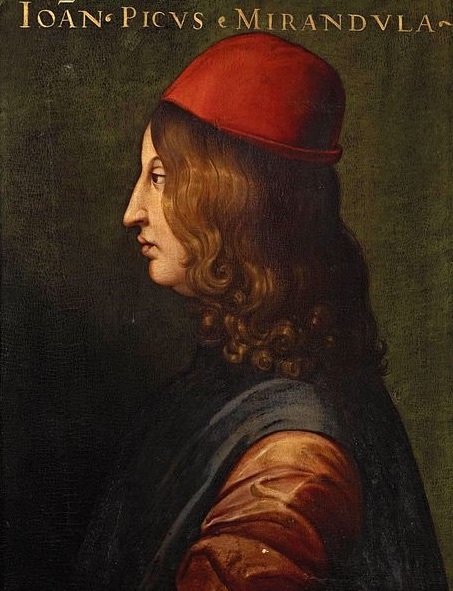 Giovanni Pico della Mirandola (1463-94), one of the most fascinating characters of the Renaissance, grew up in a very accomplished noble family, lords of the little town of Mirandola on the Po. A youthful prodigy, he rapidly learned Latin and Greek, and made some headway in Hebrew and Arabic too. Young Pico was obsessed with philosophy, and he wanted to learn it all. At age 14 he set off for Bologna to study law. By 1484 he had been through many of the universities of Italy, and had made the acquaintance of some of the leading scholars and statesmen of his day: in particular, he made a deep impression on his teacher, Marsilio Ficino, and fellow student Lorenzo de' Medici, who would be his protector for the rest of his life. By the age of 23, Pico was causing a Europe-wide commotion with his '900 Theses' on religion and philosophy, some of which the Pope found to be heretical. It was only the beginning of a short but very picaresque life for Pico, one that included a couple of spells in prison, great public debates, time in exile, a friendship with the notorious Savonarola, and at least one good beating from a cuckolded husband. In part, it was Pico's Humanist ideals that kept him in hot water: the Neoplatonism of his great work On the Dignity of Man, and the religious syncretism that gave him the idea that all religions sought the same truth, only from different angles. But as always in this fiendishly complex, much-misunderstood Renaissance, there was more to it. What really kept Pico up burning the midnight oil was magic and the occult. Historians once liked to pretend that the Renaissance was all about escaping the mire of medieval superstition and recapturing the spirit of classical rationalism. Quite the opposite; while the medievals were more level-headed and rational than anyone gives them credit for, Pico, and everyone else in the court circles he frequented, compared their magical amulets and geometric mandalas and exchanged news on the latest wisdom from their celebrity astrologers. Pico was looking for the truth not so much in Aristotle and Plato as in the Kabbala, and the prophecies of legendary Hermes Trismegistus, and like Marsilio Ficino, he believed in a kind of operative magic that could control the forces of nature and the stars and put them to use for man. Still, his was a life full of contradictions, as seen in the fierce and sarcastic attack on astrology he made in a book called Disputationes adversus astrologiam divinatricem—not because astrology was false in itself, but because its practitioners interpreted it deterministically, with no room for the freedom of man. And Pico would turn back to conventional religion in the end, under Savonarola's influence. He was planning to become a monk when he was poisoned, possibly on the orders of Lorenzo de' Medici's successor Piero.